Right-handed pitcher Henry Ward "Hank" Johnson started his professional baseball career close to home with back-to-back seasons for the Bradenton Growers in the Class-C Florida State League in 1923 and 1924. , Johnson was 2-0 his first season and 10-8 in 1924. Johnson was born in Bradenton on May 21, 1906, the fifth child among four girls and two boys. His parents were Morgan Jackson Johnson, a cattle raiser and agent according to the 1910 census, and Pernetta "Nettie" T. Pope Johnson. Ten years later, Morgan Johnson was recorded as a farmer. Henry attended Manatee County High School. Purchased by the New York Yankees in 1924, he was noted as a comer in spring training 1925 by wire service writer Warren W. Brown: "Henry Johnson, who comes from Bradenton, Fla., is the best of the young pitchers. "1 Indeed, he made the team out of spring training and worked one inning of hitless relief in his debut game, April 17 against the visiting Senators, facing three batters and recording three outs. His ERA leapt from 0.00 in his third outing, however, when he gave up five runs in two-thirds of an inning. He cut that back down over the course of the season; after 24 appearances, though, he still had an ERA of 6.85. He'd started four games and lost three of them, two by scores of 5-4 and 4-2 His lone victory of his rookie year was a shutout (eight hits and one base on balls) against the visiting Indians on September 17. He got the work, appearing in 35 games for the St. Paul Saints of the American Association. His 4.41 ERA was better than his 6-15 record, though won/loss records often reflect the team as a whole. He missed some time in midseason due to illness blamed on the extraction of a tooth. Johnson was 5-foot-11 and listed at 175 pounds. Though he both pitched and batted right-handed, he was said to be ambidextrous.10 He appears in most record books as Hank Johnson, but not once in any of the more than 1,000 newspaper stories reviewed for this biography was he ever called Hank. When asked what his nickname was, he wrote on his Hall of Fame player questionnaire that it was "Hank." He could have left the space blank or written in that he had none, but it appears that it was not a name that was ever used in the newspapers of the day. He didn't appear in the 1928 World Series, largely because of the weather. With Waite Hoyt, George Pipgras, and Herb Pennock on the staff, Johnson was the fourth starter. The Yankees swept the Series from the Cardinals in four games. Tom Zachary pitched Game Three, but Huggins had Johnson warming up in the bullpen before the game, and he warmed up from time to time throughout but was never needed. There was debate whether or not Huggins would go with Hoyt in Game Four, or give Johnson the start, but when it rained, that gave Hoyt an extra day of rest and Huggins decided to go with Hoyt, who won the game and was 2-0 in the Series. He appeared in 44 games (15 of them starts) in 1930, throwing 175 1/3 innings. He was 14-11 (only Red Ruffing and George Pipgras, with 15 each won more). His ERA was 4.67. Johnson's 1931 season was similar, though he started more often -- 23 times in 40 appearances. He was 13-8, 4.72. Johnson started 21 games, and relieved in four others. He was one of the few Sox pitchers with a winning record (8-6, 4.06 – his best season for ERA) for the seventh-place team. He likely would have won more, but he hurt his elbow in the August 20 game, had to be operated on, and was unable to pitch again that season. During the winter, Johnson was one of the few Red Sox players to ever visit Tom Yawkey's place in South Carolina; he went duck hunting there with Eddie Collins and George Pipgras in December. 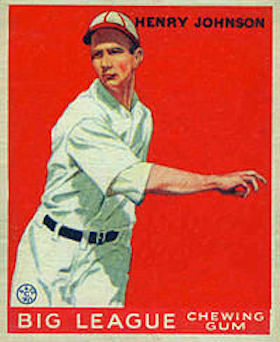 Johnson started three games in April 1936 for Connie Mack's Athletics. He lost the first two and had a no-decision in the third. His ERA was 7.71. On April 30, he was sold to Montreal and returned to the International League. He recorded a 3.53 ERA for Montreal, with a 9-10 record. In 1937, he pitched for the Royals again with an 11-7 (3.69 ERA). From 1938 into 1941, Johnson worked for the Southern Association's Birmingham Barons. He was 11-13 (4.10), 9-3 (3.65), and 12-5 (4.44) the first three seasons. In 1941, he began the season with the Barons and was 7-6 when he was traded to the Memphis Chicks. He won six and lost six with the Chicks. Memphis hired him again for 1942 but he missed the entire season with an injured leg, or back (reports differ.) He was briefly with Memphis again in 1943, his last season in baseball, but worked only 16 innings in four games. Johnson worked as an auto salesman in Bradenton, and in 1950 was elected on the Democrat ticket as constable in the Manatee County (Florida) tax department, unopposed. He died at the hospital in Bradenton on August 20, 1982. In addition to the sources noted in this biography, the author also accessed Johnson’s player file and player questionnaire from the National Baseball Hall of Fame, the Encyclopedia of Minor League Baseball, Retrosheet.org, Baseball-Reference.com, Bill Lee's The Baseball Necrology, and the SABR Minor Leagues Database, accessed online at Baseball-Reference.com. 1 Warren W. Brown, "Slugging Nick Cullop is Sensation of Yankees' Camp," Richmond Times Dispatch, March 14, 1925: 9. 2 Walter St. Denis, "On the Sports Highway," Miami Herald, October 23, 1925: 12. 4 Marvin McCarthy, "Henry Johnson, Who Learned His Baseball at Bradenton, Found Athletics Not So Bad," Tampa Tribune, October 28, 1928: 47. 5 "Yankee Recruit is Cited Twice," Tampa Tribune, March 21, 1926: 34. 6 Dan Daniel, "Johnson Justified Faith Placed in Him by Huggins," New York Telegram, June 23, 1928. 7 Alan J. Gould, "Yankees 'Luck' Ascribed to Huggins' Management," Washington Post, June 30, 1928: 11. 9 "Obituaries," The Sporting News, September 6, 1982: 20. 10 "Baseball Here and There," Ed. R. Hughes, San Francisco Chronicle, June 24, 1928: 86. 11 Richards Vidmer, "Yankees' Hopes Lie in Their Bats; Pitching Main Reliance of Cards," New York Times, October 3, 1928: 25. 13 "Johnson, of Yankees, Marries Florida Girl," Washington Post, February 26, 1929: 13. 14 "Johnson Left, Bride Is Ill," New York Telegram, March 30, 1929. 15 "Yanks Lose Star Hurler for 'Crucial' Series with Macks," Charlotte Observer, June 20, 1929: 19. 16 William E. Brandt, "Yankees Are Idle, No Games Scheduled," New York Times, July 30, 1929: 22. 17 "Wright, Craig and Johnson Are Reinstated," Boston Globe, January 25, 1930: 9. 18 Handwritten letter signed by Henry Johnson in Johnson's Hall of Fame player file. 19 James C. O'Leary, "Quinn Tries to Avoid Wrangle," Boston Globe, January 21, 1933: 10. 20 "Obituaries," The Sporting News, September 6, 1982: 20. 21 "Nats Invade for Third-Place Fight," Cleveland Plain Dealer, June 20, 1932: 15. 22 M. G. McGann, "Mixing with Mickey," State Times Advocate (Baton Rouge), June 28, 1932: 10. 23 Unidentified January 5, 1933 news clipping in Johnson's Hall of Fame player file. 24 Burt Whitman, "Eddie Collins Impressed By Pitching of Henry Johnson," Boston Herald, March 9, 1933: 15. 25 Washington Evening Star, June 14, 1934: 49. 26 James C. O'Leary, "Cramer, McNair Come to Red Sox," Boston Globe, June 5, 1936: A1. 27 Associated Press, "Cincinnati Reds Vote Division of World's Series Coin to Team," Dallas Morning News, October 4, 1939: Sect. II, 3.